Why can't I see time in TSheets that I entered in Karbon? If you have tracked time in Karbon but it is not showing in TSheets, it is likely that the work item or contact is no longer connected. If you have tracked time against a work item or contact in Karbon but it is not showing in TSheets, it is likely that the work item or contact is no longer connected and/or the code in TSheets has been deleted. In this case, we suggest following these steps. Save & Sync the connection between TSheets and Karbon from Settings > Connected Apps > TSheets. This will resync the connection between the two apps and prompt Karbon to re-check for all TSheets codes. From then, if anyone attempts to track time against a work item or contact that is no longer linked to TSheets, the following message will appear. 4. 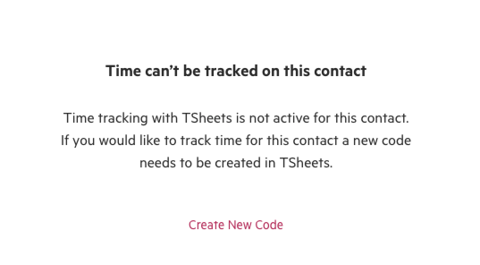 If you see this message, a new code can then be created, which will re-link the item to TSheets and allow time to be tracked.